The United States and China have agreed to place tougher financial sanctions on North Korea. This cooperation between the U.S. and China against North Korea shows a shift in their relationship, said The New York Times. The sanctions are meant to punish North Korea for its recent nuclear and long-range missile tests. The United States and China reached an agreement on imposing new U.N. sanctions on North Korea Wednesday. Details have yet to be released on the proposal. 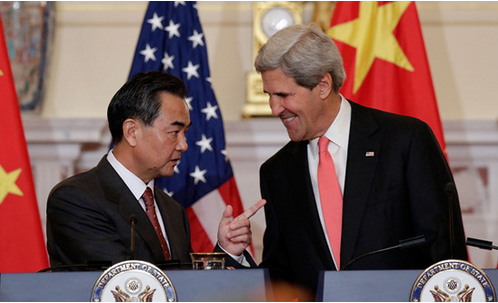 The announcement came after China's foreign minister Wang Yi's visit to Washington. He met with Secretary of State John Kerry and with National Security Adviser Susan Rice earlier this week. U.S. National Security Council spokesman Ned Price said Rice and Wang were in agreement on a "strong and united" response to the North Korean tests. South Korea's Foreign Ministry spokesman called the draft resolution, "strong and comprehensive." He said, "It contains many effective components which are stronger than anything in past." The United States has supported tough economic sanctions to pressure North Korean leader Kim Jong Un to give up his nuclear weapons program. China has emphasized maintaining stability in the area and negotiations. However, China may be signaling that its approach to North Korea has not been working. It may be agreeing that stronger measures are needed. North Korea has been under U.N. sanctions since 2006. It has claimed to have carried out four nuclear tests and a number of long-range rocket launches. In addition to a U.N. arms embargo, North Korea is banned from importing and exporting nuclear and missile technology. It also is banned from importing luxury goods. South Korea's Yonhap news agency reports that the proposed resolution will target North Korea's atomic energy and aerospace agencies. Some experts doubt that targeting North Korean officials and agencies will have any impact. They question whether the final agreement will impose real economic pain that will be felt by leader Kim Jong Un and the leadership. The U.S. has supported banning North Korean coal and other mineral exports. It has also supported barring oil trade and restricting North Korean access to international ports. The U.S. also wanted to increase restrictions on North Korean banks' access to the international financial system. Chinese and South Korean media reported this week that China has ordered a halt to its coal trade with North Korea. They say some Chinese banks have frozen accounts belonging to North Koreans. China's Foreign Ministry said it does not know of these developments. However, experts say there is increased popular support in China to cut off possible funding for North Korea's nuclear program. "China has been intensively discussing how to internally block oil and cash from flowing into North Korea," said Woo Su-keun, a professor of international relations at Donghua University in Shanghai. There have been questions that China would be slow to reach agreement on U.N. sanctions. The U.S. and South Korea are considering the possible deployment of the controversial Terminal High-Altitude Area Defense, or THAAD, missile defense system. China and Russia oppose THAAD deployment in Korea. They are concerned that it can possibly be used against their military forces in the area. This week, the Chinese Ambassador to South Korea, Qiu Guohong, suggested China would cut ties with South Korea over THAAD deployment. South Korea's Deputy Foreign Minister, Kim Hong-kyun, criticized the Chinese ambassador for attempting to exert influence over a South Korean national security issue. President Obama recently signed legislation placing new U.S. sanctions on North Korea. The bill requires sanctions on anyone assisting North Korea in its nuclear and missile programs, cyber-attacks or human rights abuses. The expanded sanctions are designed to deny North Korea the money to develop miniaturized nuclear warheads and missiles to carry them. The measure also authorizes $50 million over five years for radio broadcasts into North Korea and to support humanitarian assistance programs. The government agreed to peg down the retail price of certain basic foodstuffs. The U.S. has intensified its financial sanctions targeting Burmese junta leaders. We must plan a program covering our immediate and our long-range needs. The two parties reached an agreement over the terms for the contract . 1.The United States has supported tough economic sanctions to pressure North Korean leader Kim Jong Un to give up his nuclear weapons program. At no time should you give up studying. My doctor advised me to give up smoking without delay. 2.It has also supported barring oil trade and restricting North Korean access to international ports. We mustn't allow such a person access to confidential matters of the state. I have access to his office.